If anyone still needs validation that Boeing is as strong as ever, they’ve just released their third quarter delivery numbers, and they are off the charts. The fact that Boeing delivered exactly 100 airplanes in 3Q 2006 has to be rough news for the folks across the pond, with 81 737NGs, 13 777s, three 747s and three 767s going out Boeing’s door. That’s a 60 percent increase over 3Q 2005, and pushes the company’s 2006 deliveries to just five birds short of 300. 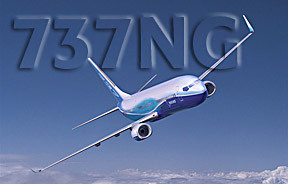 • Overall, the entire 737 family is the best-selling commercial jet in history, winning orders for more than 6,000 737s. • More than 541 operators fly 737s into more than 1,200 cities in 190 countries. • With more than 4,100 airplanes still in service, the 737 represents more than a quarter of the total worldwide fleet of large commercial jets flying today. • On the average about 1,250 737s are in the air at all times; one takes off or lands every 4.6 seconds. • The 737 fleet has carried more than 12 billion passengers. • Since its commercial revenue service history began in 1968, the 737 fleet has flown more than 75 billion miles -- equivalent to approximately 403 round trips from the Earth to the sun. • Airlines ordered 737 models of the Next-Generation 737 before the first airplane was delivered on Dec. 17, 1997. • There are approximately 36.6 miles of wire on the Next-Generation 737-600/-700/-800/-900 models. • On average, there are approximately 367,000 parts on a Next-Generation 737 airplane. All this talk of 737s gets me thinking again (in my freakin' dreams) about owning a BBJ. With one of those, I could forget chasing hamburgers forever and could chase some serious Filet Mignon instead.